Copyright © 2002 by Eric M. Jones. Last revised 29 April 2006. Detail from AS17-134-20475, taken by Jack Schmitt at the end of EVA-3. 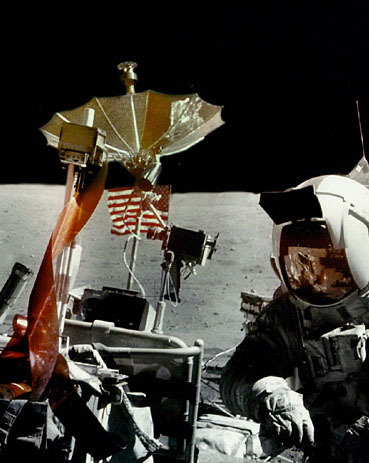 In a number of lunar surface photos, especially a series of tourist photos that Jack Schmitt took of Gene Cernan at the end of EVA-3, a bright pattern can be seen on the umbrella of the high-gain antenna. The detail above is an example. After considerable discussion by the ALSJ Team, we conclude that the pattern on the high-gain umbrella is sunlight reflected off the top of the TV camera, which is prominent at center left in 20475. The fact that we are dealing with a reflection is shown most dramatically by a detailed comparison of three of Jack's tourist pictures: 20475 to 20477. In a labeled strip containing the three images, note the change in position of the features labeled 'notch' and 'A' relative to the ribs from picture to picture. These changes indicate that the pattern is not intrinsically part of the umbrella, say scratches caused by contact with Gene's OPS antenna as I once thought. As indicated in a labeled detail from 20475, the source of the reflected sunlight is to our left and below the pattern on the umbrella. Specifically, we see that when features in the pattern are traced from the left, they continue onto the ribs but are then interupted because the reflection is shadowed by the ribs. 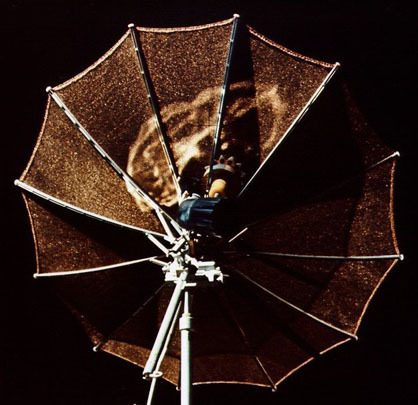 The top of the TV camera is covered with mirror tiles (see for example, AS17-134-20454) and AS15-90-12220, making it a possible candidate as the reflector that produced the pattern on the umbrella. 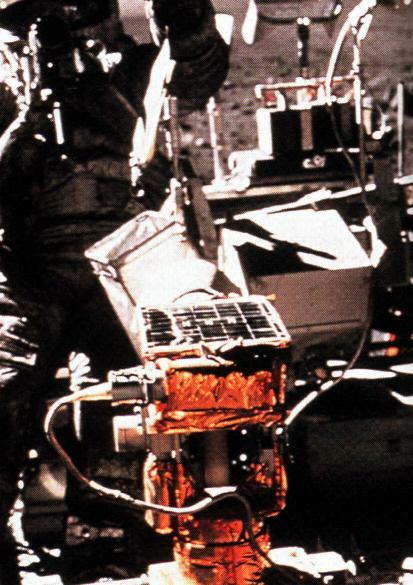 Other potential reflectors are the mirrored top of the LCRU, the LCRU blankets hanging down at the front of the Rover, the maps attached to the accessory staff, and the Gene's and Jack's face plates. The face plates are easily eliminated because reflections off their curved surfaces could be seen from many locations, not just a small area. Rather, the reflector must be a relatively flat surface of roughly the same size as the pattern on the umbrella. As we discuss next, simple geometric considerations clearly indentify the top of the TV camera as the source of the reflection. Gene has parked the Rover perpendicular to the direction to the Sun. At the time 20475 was taken, the Sun's azimuth was 108 degrees and Gene parked the Rover on a heading of 18 degrees. The difference is 90 degrees. 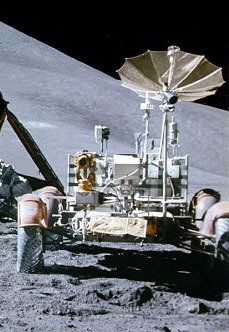 As indicated in Figure 4-1 in the Rover Operations Handbook, the mounting points for the TV and the high-gain antenna mast are both on the front edge of the Rover. Consequently, with the Rover parked perpendicular to the Sun and reasonably level, a reflection of the Sun off the top of the TV camera will either hit the staff, the umbrella, or pass above them, depending on the Sun's elevation. 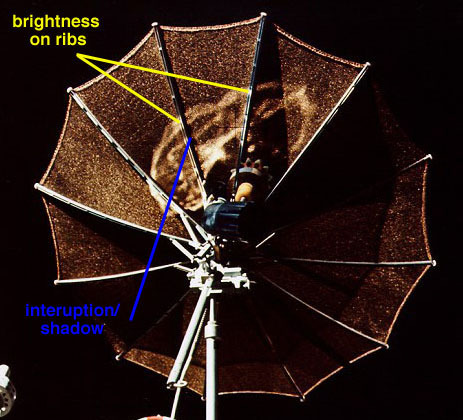 The center of the umbrella is about 50 cm above the top of the TV camera and the mounting points of the TV and the high-gain are about 80 cm apart. At the time Jack took 20475, the Sun's elevation was 38 degrees and, consequently, the Sun's reflection would hit the umbrella 13 cm above the center of the umbrella. A final piece of evidence is provided by a further comparison of the three photos Jack took of Gene. The TV record of this part of the mission clearly shows that Ed Fendell was panning the camera from right to left during the time Jack was taking the three Hasselblad images. Changes in the pointing direction of the TV can be seen in the three photos. Examination of details of the reflection on the umbrella shows that the pattern correlates well with position of the camera. Our analysis strongly indicates that the pattern seen on the high-gain umbrella is a reflection off the top of the TV camera. However, there is one aspect of the phenomenon that is not completely explained. If the top of the camera was perfectly flat, the pattern on the umbrella should have a shape similar to the shape of mirrored top of the camera, with only minor difference due to the curvature of the umbrella. In thinking about possible causes for the markedly non-rectangular pattern seen in the Apollo 17 photos, we considered and rejected the effects of dust on the top of the TV camera. It seems to us that the only likely cause is that the top of the TV camera was not perfectly flat. Distortions in the reflecting surface can produce an irregular 'image' but, of course, this is speculation. Mick Hyde, Harald Kucharek, Ulli Lotzmann, Brian McInall, Markus Mehring, Gary Neff, Kipp Teague, Ron Wells, and David Woods contributed to this analysis. Note added on 10 June 2005: The analysis above was completed on 2 November 2002. 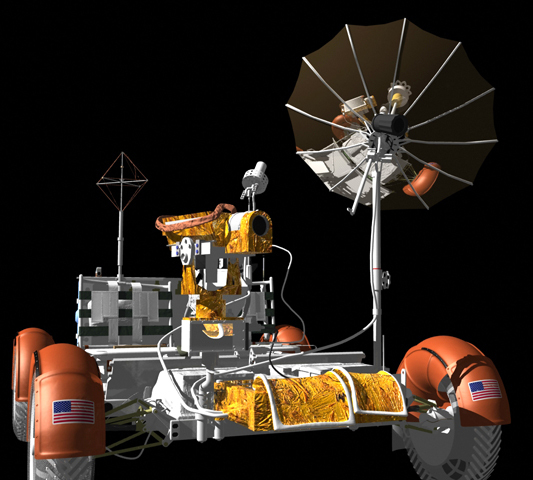 Since then, Don McMillan has done some brilliant work constructing a Virtual LRV for each of the Rover missions and, in the course of that work, has provided realizations of reflections that would be seen on the high-gain antenna. He writes "I have made the surface of the high gain antenna mesh very reflective. That way you can see more clearly what is being reflected in the antenna. Please note that only the general aspects are close to being right. I used the sun angle data from the Journal page and tried to match as best I could the angle of both the TV camera, of the high gain antenna, and angle of the rover in AS17-134-20475." 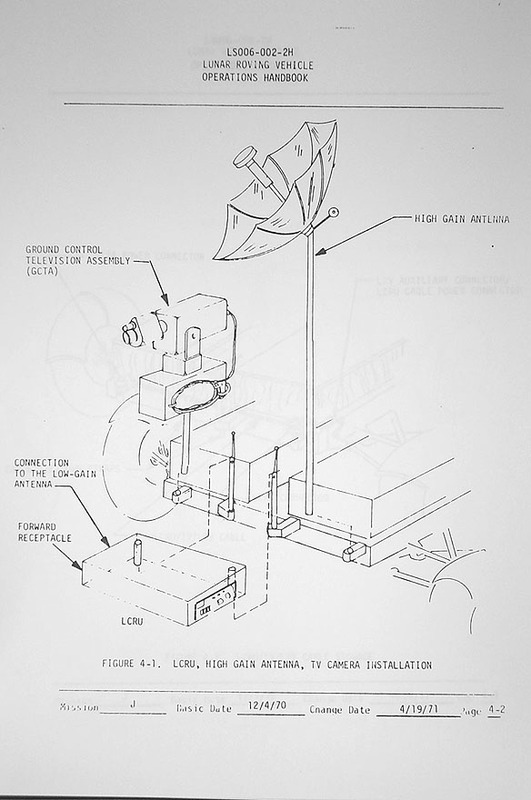 Don continues, "As I said on my site, the solution given in the Journal appears to follow what you can see in the image. The top of the TV camera appears to be in the same place as the reflection." 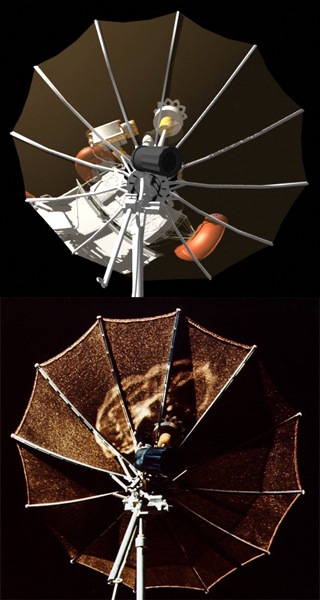 Comparison between the view in a highly reflective virtual antenna and 20475.